Dr Matthew Christ, "The Limits of Altruism in Democratic Athens"
Athenians in the classical period (508-322 BC) were drawn to an image of themselves as a compassionate and generous people who rushed to the aid of others in distress, both at home and abroad. What relation does this image bear to actual Athenian behavior? 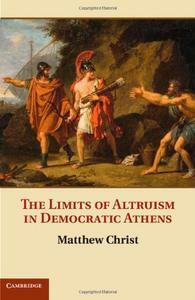 This book argues that Athenians felt little pressure as individuals to help fellow citizens whom they did not know. Democratic ideology called on citizens to refrain from harming one another rather than to engage in mutual support, and emphasized the importance of the helping relationship between citizen and city rather than among individual citizens. If the obligation of Athenians to help fellow citizens was fairly tenuous, all the more so was their responsibility to intervene to assist the peoples of other states; a distinct pragmatism prevailed in the city's decisions concerning intervention abroad.